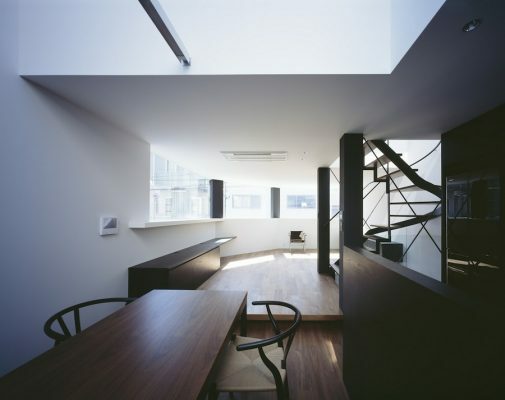 Cave House is a house for a single person, built in a quiet residential area in Kagurazaka, Tokyo. 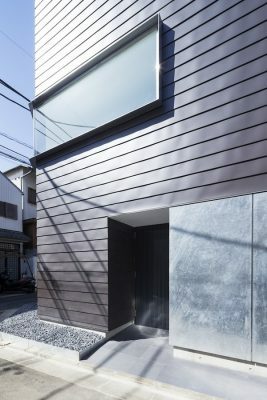 The exterior walls use dark brown Galvalume steel in a length-wise, lateral direction, in order to blend into the atmosphere of fleshpots surrounded with black board fences. 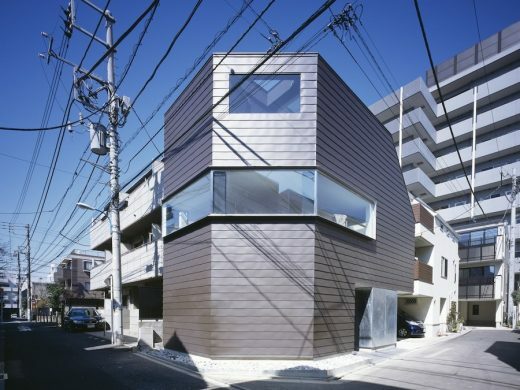 Galvanized steel sheets are used for exterior walls next to the entrance and around the garage. 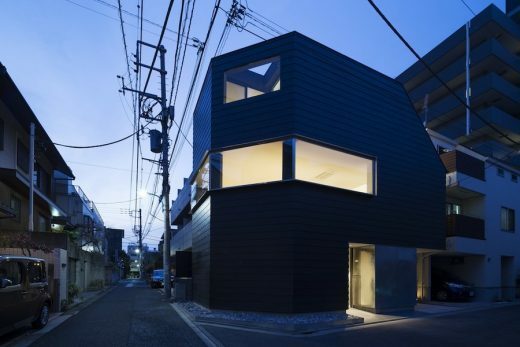 By using a combination of different steel sheets, a playful contrast is created. The impressive feature of the exterior is the panoramic corner window, which makes full use of the characteristics of the corner site. 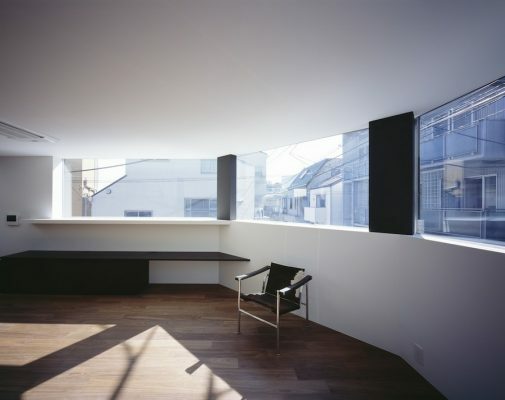 The window horizontally frames the view of the road side, and provides a depth and spaciousness to the compact interior. The wine cellar in the basement is furnished with a custom-made rack, sofa, and bookshelves in a study, and electronic drums can be played there. 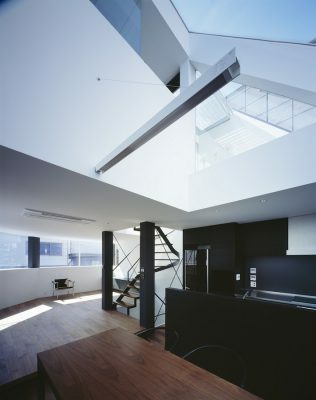 A spacious storage is located on the first floor. 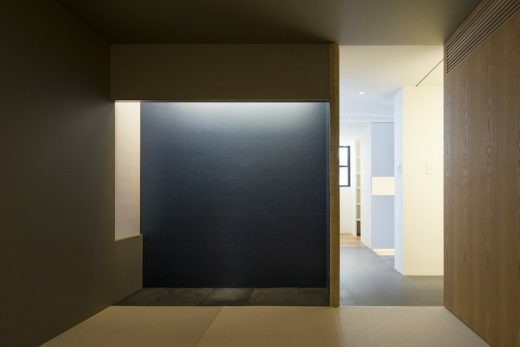 The Japanese style room serves as a guest room, with minimum natural lighting. 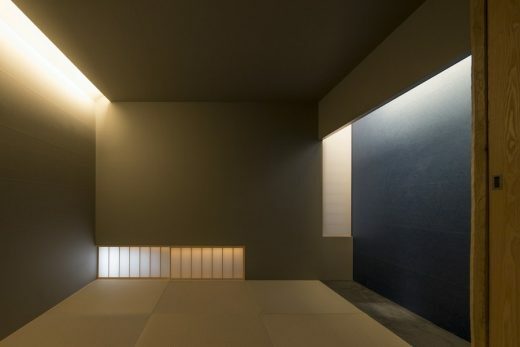 Gray and indigo Japanese paper, and pinkish-gray tatami mats are unified with the structural lighting to create a microcosmos. On the second floor, a spacious open kitchen is made for the owner who loves cooking, and a walnut dining table is placed to accommodate many guests. 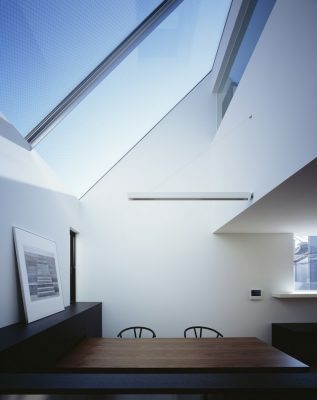 The large skylight provides soft diffuse light through the open ceiling. 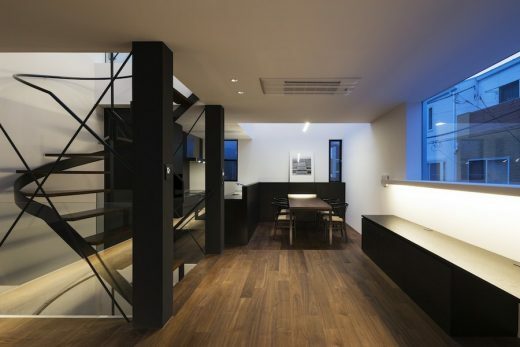 The dining room, where people sit on chairs, and the living room, where people sit on the floor, are loosely connected with a step to form a sense of unity. 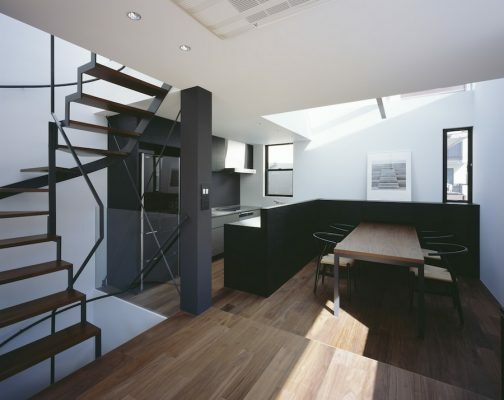 Private spaces such as a bathroom, toilet, main bedroom, and a small garden are made on the third floor. 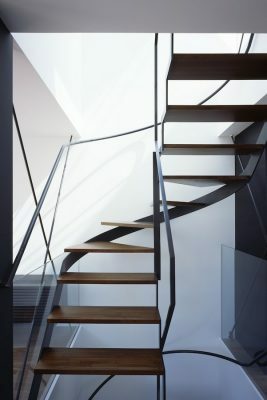 This four-level house can be enjoyed by moving up and down via the see-through stairs located in the center. Natural light showers from the skylight, high window, and corner window. 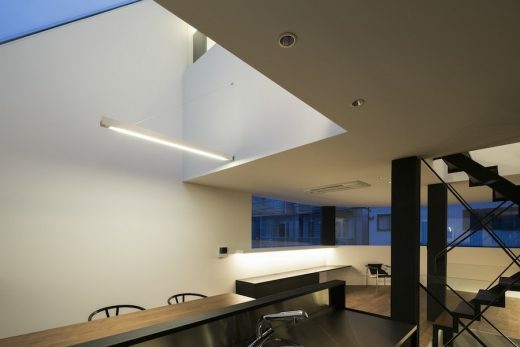 Various openings frame the town views and sky views and accent the rooms to create spaciousness and depth, which can hardly be expected in urban houses.